#pm_ngt training is MORE valuable – FACT! 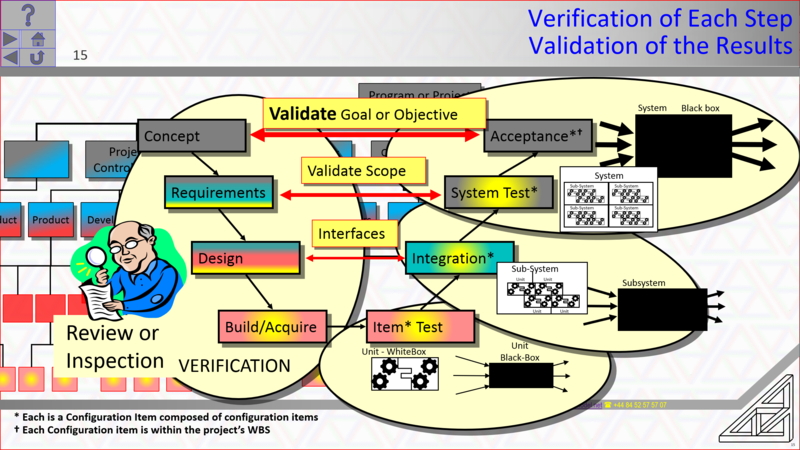 Verification and Validation are two terms sometimes used interchangeably and sometimes used with swapped meaning. VERIFICATION is in-process – ongoing during development of the product. It means ‘is built to standards’ or ‘matches the specification’. ISO etc., say Verification is all the continuous in-production processes that often involves testing and measurement. It doesn’t tell us if we’ve solved the customer’s problem but it does tell us we’ve followed good processes to arrive at a result that is what was asked for. Accepted deliverables may contain non-conformance from the specification and standards that were raised during verification. The customer may be happy to live with non-conformance. Verification – Built it right. The inputs are the product, the specification and the contents of the quality system. The outputs are the list of non-conformance (if any). Validation – Built right thing. The inputs are the product, the list of non-conformances and the customer’s opinions. The result is acceptance (or not). Of course, anyone is free to use alternate meanings if they wish.